The Boroondara Tennis Centre is one of Melbourne's premier public access tennis facilities. The Centre is owned by Boroondara City Council and is managed and operated on their behalf by Maher's Tennis Management Services. The Centre has 23 fully lit outdoor courts, making it one of the largest tennis venues in Victoria, with synthetic grass, synthetic clay and hard court surfaces available. We run a full array of tennis programs, competitions and events to cater for players of every age and ability. We are open 7 days a week with Public court hire available every day. Private and group tennis coaching 7 days per week. Coaching includes Hot Shots (4-7 years), Junior Group Coaching (8-17 years), Adult Group Coaching, Cardio Tennis and Training Squads. We have Competitions 7 days per week. Junior Competitions - 3 days per week, Open Mixed Night Competitions - 4 nights per week, Ladies Social Competitions - 3 mornings per week and a Morning Social Round Robin. 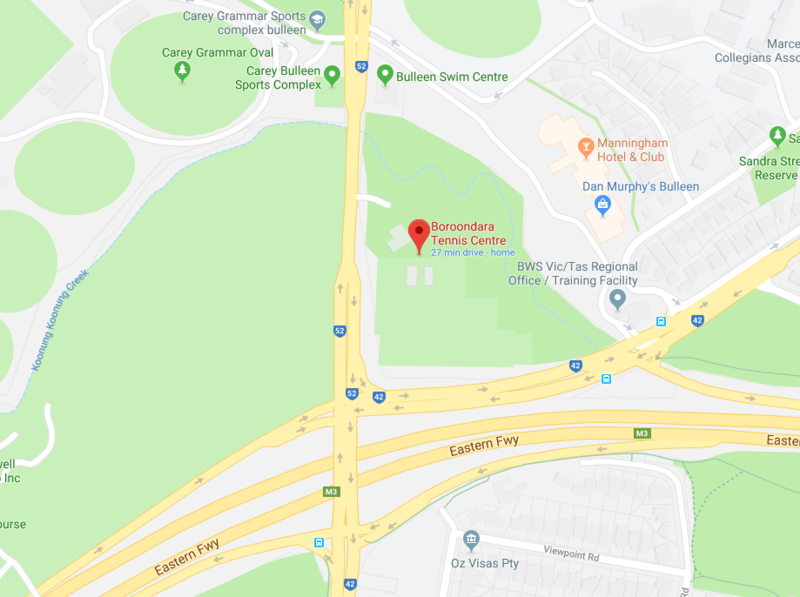 The Boroondara Tennis Centre operates as a public centre, rather than a tennis club, which means our courts are always available for public casual hire, without having to sign up or pay for a membership. The Centre has 23 floodlit courts available for public hire 7 days per week. Choose from synthetic grass, synthetic clay or hard court surfaces. Servicing Boroondara and the areas of Balwyn, Bulleen, Doncaster, Kew, Lower Templestowe, North Balwyn and Rosanna with Tennis Court Hire day or night. Bookings are always recommended on 9850 4500. The Boroondara Tennis Centre prides itself on offering the highest standard of Tennis Coaching available, with more programs, catering for more age groups and standards than ever before. We run both private and group coaching for players of all standards, starting form 4 years of age. Our tennis coaching program runs 7 days per week, with classes in the mornings, after hours for adults, after school, weekends for juniors and training squads for tournament and competition players every weeknight. We have over a dozen tennis coaches on staff available for day and night time tennis coaching. We have Competitions 5 days per week. Junior Competitions - 4 days per week, Open Mixed Night Competitions - 4 nights per week, Ladies Social Tennis Competitions - 4 mornings per week and Morning Social Round Robins - 2 mornings per week.